Busted phone? Need to buy anything from a hair pin to a new TV? Jewellery? Shades? Literally anything? 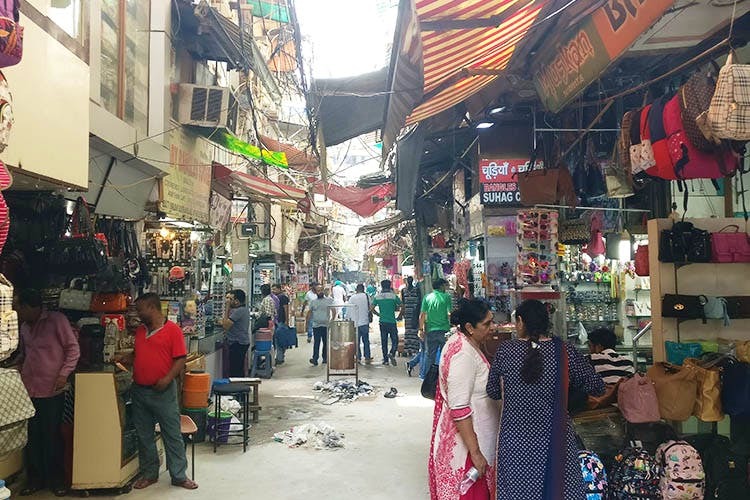 Your next visit to Karol Bagh holds the key to the treasure chest that is Gaffar Market. Here’s what to look forward to on your next visit. The market is dominated with mobile repair shops. Be it a cracked screen or a fried motherboard, your phone or tablet is undoubtedly gonna get resurrected. The market is famous for unoriginal parts for your beloved gadget (which cost a fraction of the price). So, if you’re not in the mood to shell out big bucks for a cracked screen, this might be your pit stop. You will also find smart TVs, PlayStations, cheap Chinese phones, branded speaker systems, any other kind of electronic gadgetry you might be cuckoo over. The one thing you’ll see scattered all over the market are phone covers. Prepare your mind for a perpetual dilemma, because there are just so many choices! Endless colours, countless designs, different materials, and, for any phone model you might have! If you’re looking to play dress-up with your phone, Gaffar is the place to hit up. You will also find cheap screen guards and tempered glass guards for your phone here. As you switch from one alley to another, your world might change from electronics to lifestyle products. Hunt down your favourite graphic printed tees, kurtis, towels and bedsheets with your favourite football team’s logo emblazoned on it; it’s all there. You can get your fair share of jewellery and footwear here, too. Roadside stalls rule the footpaths with everything from banta to chuski on offer. You’ll find golgappas and samosas in the corners of the alleys, with some chaat vendors with stalls set up in the smack-dab-middle of the market. So, when you start feeling exhausted from all the shopping, fit a couple golgappas in your mouth, take a sip of that masala banta and off you go again!